Hey everybody! I haven't found and introductory thread yet, and so I figured I would start it! Introduction threads I found have been helpful in other sites, so I think it could be valuable here as well especially for a new site. Tell us how you found GlobalComix! Then share the cool stuff. 4. Describe your comic and tell us about it! 5. If you want to, upload your favorite page to share that awesome art! PLEASE Comment and share your information so I can find some new comics to read and greet new users!! Be active and read each others' comments, give feedback on their pages and be kind! Thanks in advance and I look forward to meeting all of you!!! I'll go first! I actually found this place from the ComicBookHour tweeting session on Twitter! I had heard of it before, but wasn't sure if it was even open to posting or not. Then when they reached out to me, I decided to give it a try and I'm quite happy here so far! Excited for the release though. 1. My creator name is AhkwardKat, comes from my main character named Ahk! My name is Kat. Then awkward and ahkward sound the same, so I thought it was kinda funny. Ahkward has been my username on deviantArt for a LONG time, so I kept that and added Kat on the end to make it a little more identifiable. 2. My comic name is Naor: Murder of an Island. 4. Naor is essentially a murder mystery mixed with a supernatural drama. A small bird named Koko loses his mentor who is teaching him magic. Koko takes her place in the village and seeks out revenge on who killed her. Six years after that, Koko finds Ahk, who he thinks is guilty of killing his teacher and forces him into a servant contract as payback. Koko ends up breaking some rules to get his revenge and now the gods are trying to punish him while Ahk tries to prove his innocence and find the real murderer. 5. 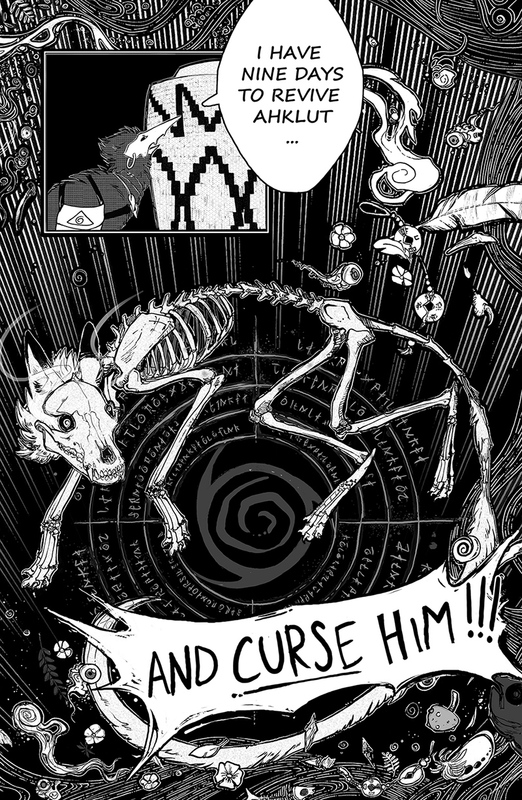 Here is one of my favorite pages and it also pretty much sums up the comic. Hello AhkwardKat and everyone - My name is Johno and I am from Cape Town South Africa. I am the creator on The Hours After Midnight, which is a mish-mash of genres I guess. The story is told from the view points of 3 factions, an elegant masked vigilante, a physcially broken and bitter man with a tragic past and lastly from a young recently promoted detective. Every day influences on my personal life direct and guide the story and my deepest hope is that story is engaging and that readers enjoy it. The series is set for 8 individual books and they will be around 5-100 pages at a time. My website is http://arcturus.co.za and the reason that it is not http://thehoursaftermidnight is because that url is too long and http://tham sounds like the sound that I make shortly after getting onto a skateboard and then falling off. I hope to use the site as a collection of my other stories as I am also working on a series of short steam punk world war type stories. I hope to meet many fellow creators here and feed offf you knowledge!...I mean discuss work things. My comic is called Something about Celeste. It is a simple gag-a-day comic strip, not an epic webcomic. I was influence by Bill Watterson as a child and I wanted to make something like 'Calvin and Hobbes'. Therefore, in format, my comic strip is similar to the funnies section of the newspaper. Something about Celeste is often silly and upbeat, with Celeste having weird dream sequences or breaking out in song. But sometimes the strip becomes more serious, With Paige (the second main character) self-reflecting about her life. Those strips are more serious, philosophical, poetic, and bittersweet. There is a Ying Yan to my strip. I found GlobalComix while reading the Tapas Forums, There was a thread talking about the site, i checked it out and liked it quite a bit. 2. The comic's name is Trip across the Multiverse, the main charcter's name is Trip. I think you all get it. 5. My favorite page is actually the newest one, and before anyone says anything, no, i'm not a furry. The charcters are animals because i thought it would be fun to not use human charcters. Tell us how you found GlobalComix! 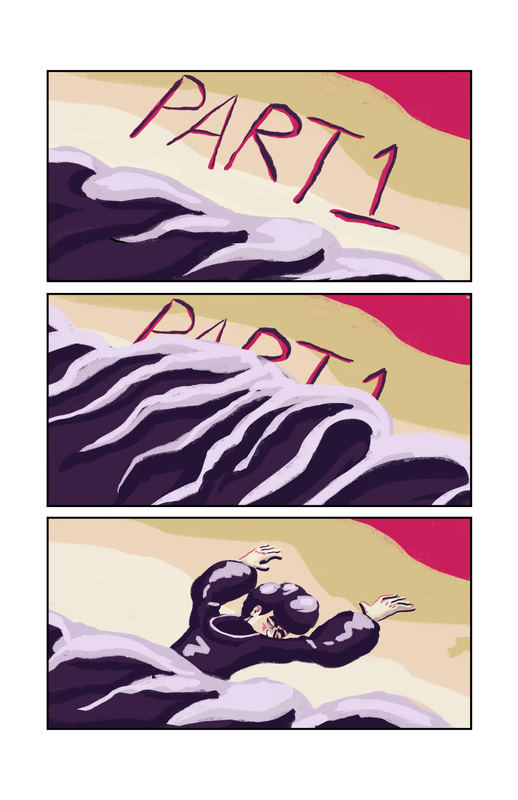 I saw it on Tapas forum. I usually see so many cool comic sites there but I don't know why I wanted to start posting here asap. It was actually quite impulsive. It has two things that every 21st century reader likes: Abstract art and Poetry. Smart, ain't I? But in all seriousness, it is an anthology of poetry. Poetry and art has gone hand in hand for centuries. It is this intertwining relationship between the two that is explored. Hello! I found out about GlobalComix first by #ComicBookHour, then again on the Tapas forum. The throughout information on Tapas is what got me into signing up. I really like the UI here quite a bit, too. 1. My creator name is starknight. 2. My comic name is "Love x Love Sound"
Just be warned that I created it for unlimited scroll/mobile websites, so I need to reformat it a bit. I haven't gotten the hang of panel creation yet. 4. My comic is a drama/romance story about a bunch of broken people trying to find their place in the world again. It's about adults in the working world, but the main focus is on Arisa Kisaragi and her daughter Hana. Thanks AhkwardKat for creating this thread! I look forward to checking out everyone's work! I found GlobalComix on the forums over at Tapas while I was looking to expand and try get my current series more readers. I didn't even hesitate to join the site - as soon as I was done reading the info about it on Tapas and actually visiting this platform, I decided I'd also start uploading here. So, that being said, hello my dudes - I'm Josh. 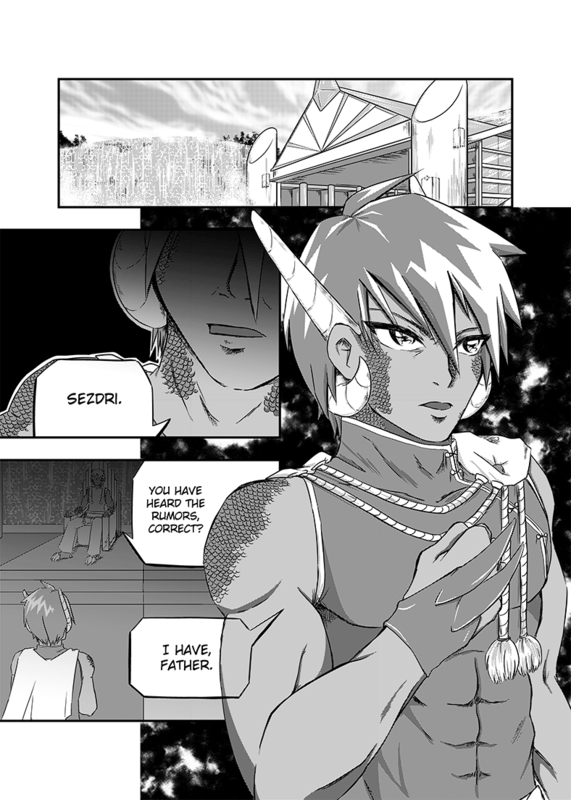 Been drawing for 4 years but only recently began taking comic/ manga creating seriously, and I'm hoping to at least get my series some exposure. HAPPY SODA DAZE! is basically a monthly comedy/ slice-of-life series that follows the daily lives of a group of first-years at a high school called Shark Bait Academy, on a group of tropical islands. The setting is inspired by real-life open-air high schools, which I think are pretty cool if you've ever had the chance to walk through one, and the art is heavily influenced by manga. Every chapter is stand-alone and there's no overarching plot; it's just a bunch of teenagers being teenagers - it's all about having fun, and leaving drama behind. This is a panel that kind of sums up the relationship between some of the students, and the sassy banter that goes on in every chapter. 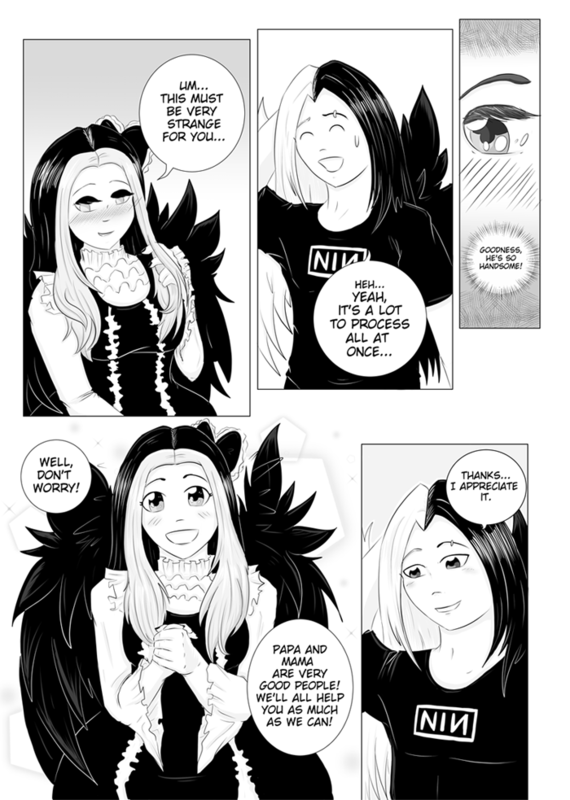 Hope you guys give it a read, and I hope this'll be a good new home for HAPPY SODA DAZE! Hey there! I'm here from tapas and I'm looking at this platform as a potential mirror. I really like the automated panel-reading thing, and also the ability to follow creators & comics SEPARATELY is a neat feature that will probably be really useful for me, since I make a lot of minicomics. 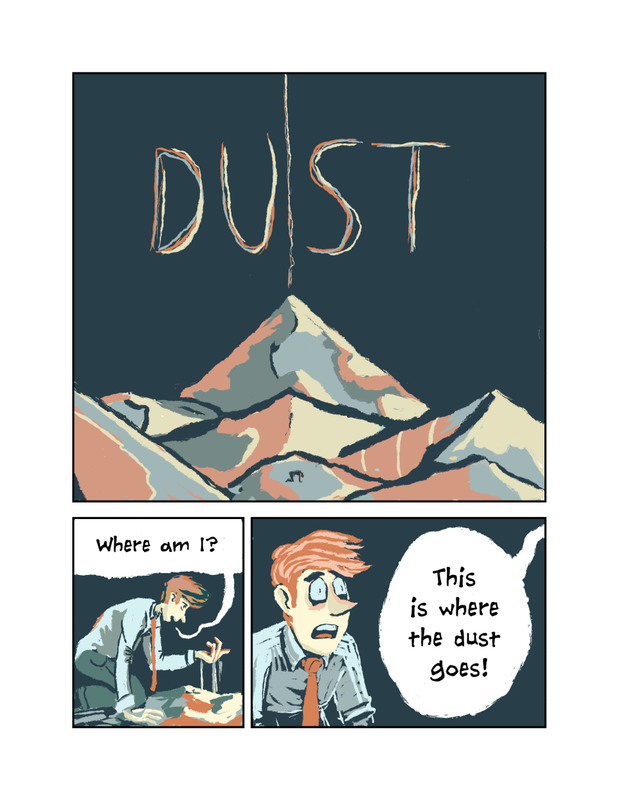 I just posted my 2017 Minicomic, DUST, here to test things out. You can find my other comics on Tapas﻿, I'll probably start porting over my other projects here eventually. Especially if I decided to do premium content. ﻿Hi! My name is Cave. I found GC from a Facebook group I follow called Webcomic Underdogs and decided to check it out! CCShion takes place 340 years in the future during a space war between humans and aliens, but there's an occult twist, a bit of a mystery going on that the crew is suddenly facing. My comic is called 'Sacred? ', it's an occult fantasy comic about a teenage boy called Chaz who discovers that he is half-angel when his powers awaken against a bully. Before he's had time to process this, the Angel of Death literally takes him under his wing, and Chaz is introduced to a world of demons, angels, gods, and more! Here's a page from Chapter Two! @Johnathonmark - Oh Cool South Africa! You must be insanely busy with all those little projects! I have mainly my Naor project.. I can't imagine having so many! That takes some serious dedication. I'll have to find time to read all the little things! I can't want to have more to read! Thank you! @Eric - I can definitely see the C&H influence on your work! It shows! The colors are bright and fun to read! It would be really cool to have them all collected in a book and printed for shows and conventions! Hehe Thanks for replying! Isn't it funny how we judge others based on what and how they draw? Quite curious! I like the style and think with a multiverse, there is SO MUCH room for fun and crazy plots. Not a big sci-fi fan, but curious to see where it goes! Thanks! @ArushiRaj -- OH WOW Poetry mixed with the visual medium of comics. I wouldn't have thought about that honestly! Quite a different way to use the medium! I love the visuals you have so far with them. I subbed and can't wait to see more! @joshuaal -- First off, I absolutely LOVE your style. It looks so well developed and consistent. I like the general humor and your backgrounds are awesome too! Def subbed and can't wait for more! Yeah, you're right, people shouldn't just assume who you are, i'm actually a little shy about my comic arround my friends because of that. Thank you again for the nice words and feel free to directly point out anything you don't quite like about the comic. I discovered the site by following Bilvy Jane and saw she was posting her comic Preheat over here. 1. Megan Hampton, though I usually just go by the alias of Hybridlizard. @NiahMakesStuff -- That's a really cool point that being able to follow creators in addition to comics allows for those who make a lot of SHORT comics to be seen more easily. I hadn't thought of that. As for your comic I really appreciate the "lack" of lines and the simple color schemes and style you use. You don't see much of that and it is nice to see it so well done! ﻿Hello! I found this from Tapas, thought it would be another venue to get some feedback on my project. 3. StarStruck! Meet your new best, and probably last friend! 4. StarStruck is a jacked up tale about relationships, wildly impractical giant robots and all the chaos that comes with them as two strangers try to help eachother home through the chaotic and colorful world of Vodella. @AhkwardKat Wow, thank you! :D I love your style as well. Your artwork is seriously amazing! I just started reading and following it. @Cavechan AH THANKS! The style is in a bit of a transition period right now. OTL I experimented a LOT with the comic as I made the Prologue and Chapter 1, now I am going back to redo them to make it more consistent. I really love that manga look you have and I wish I could emulate the manga style a lot more. You seem to have it pretty down pat! I found out about GlobalComix from Jens K Styve who suggested I should give it a try. My creator name is Vanja Utne (Cheese Pirate Comics). Vanja Utne is my real name and Cheese Pirate is my label. 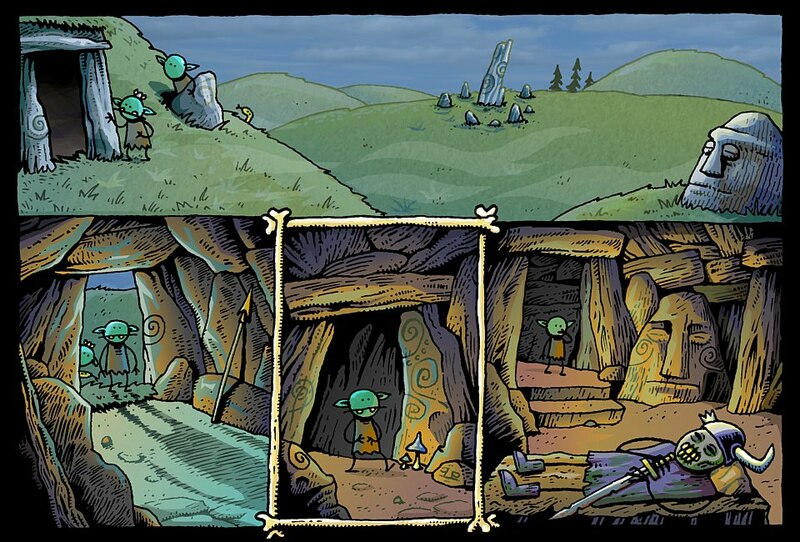 Grok and Grok are two little g̶o̶b̶l̶i̶n̶s o̶r̶c̶s goblorcs who live in a cave under a treestump. If you're wondering who is who, Grok is the one with the overbite, and Grok is the one with the underbite. Their world is full of big angry things with teeth, but also potatoes and friendly lizards and rats.